Sipping a mint julep is a tasty Kentucky Derby tradition, but we think this refreshing cocktail is also perfect for front porch sip, sip, sipping away sultry summer days. Our Mint Julep recipe is made with sugar syrup, mint leaves and your favorite bourbon poured over a mound of finely crushed ice. Serve this classic Southern cocktail in a frosty glass or sterling silver tumbler. Place the syrup and the 6 mint leaves in a 16-ounce glass. Lightly bruise the mint with the back of a spoon. Fill the glass ⅔ full with the crushed ice. Add the bourbon and stir briefly to blend. Pack the glass with more crushed ice so that the ice domes slightly over the rim. Garnish with the mint bouquet and short drinking straws. Let the drink stand until a thin layer of ice forms on the outside of the glass, about 1 minute. Serve with a cocktail napkin to catch the condensation. 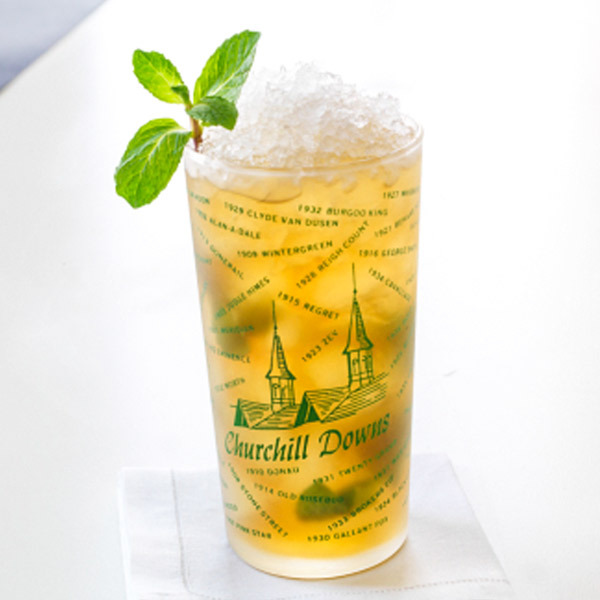 Tip: Be sure the ice is very finely crushed (almost like a snow cone) or you won’t have a real mint julep. In a saucepan, simmer 2 parts water to 2 parts sugar until dissolved.